Since living in the south for 15+ years I’ve learned to love shrimp and grits. Really, I’ve embraced all the southern cuisine; fried green tomatoes, boiled peanuts, sweet tea… I love it all! And I’m so glad my husband has done the same. I love that I can make shrimp and grits for dinner and he’s happy! It’s my easy go-to meal! The other day, while doing my weekly grocery shopping, I saw rock shrimp at the seafood counter. Now for those of you who aren’t familiar with rock shrimp… They come from right here in Florida (specifically Cape Canaveral). According to NOAA FishWatch.gov “Brown rock shrimp is the deep-water cousin of the common pink, white, and brown shrimp also found in the warm waters of the southeastern United States. It is the largest of six rock shrimp species found in this area. Rock shrimp are often called the “little shrimp with a big lobster taste.” They can easily be mistaken for a miniature lobster tail, and the texture of their meat also is similar to lobster. Most of the U.S. harvest comes from the east coast of Florida (mainly off the Cape Canaveral area). ” If you ever have the opportunity to try them don’t hesitate. They are sweet just like lobster and oh-so delicious. 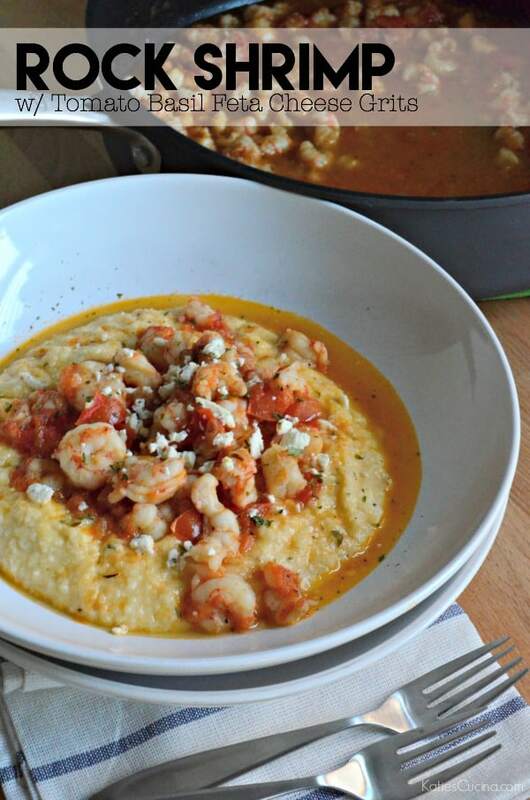 When I made this version of shrimp and grits I had the opportunity to make the shrimp portion in my new OXO sauté pan. I’m so excited to share with you today OXO’s new cookware! They have two sets Non-Stick Pro or Stainless Steel Pro Cookware. I received a Non-Stick Pro skillet. It’s light weight and huge. It’s the perfect “one pot” meal skillet. Plus it’s oven safe so if you want to finish off your meal in the oven you can! Whether your making a large meal or even dinner for just two of you (like this recipe), the sauté pan will come in handy! I love how light-weight it is making it very easy to pour the shrimp on top of the grits. 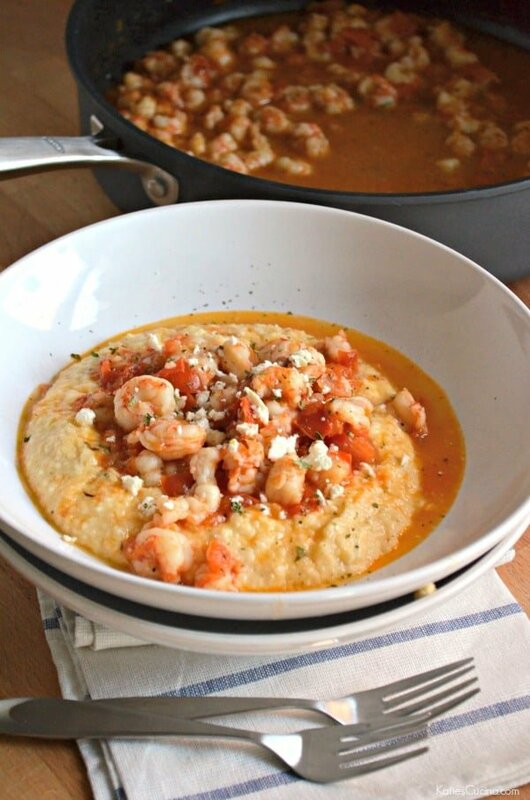 And once you’ve poured the shrimp on the grits add some additional feta to your plate. 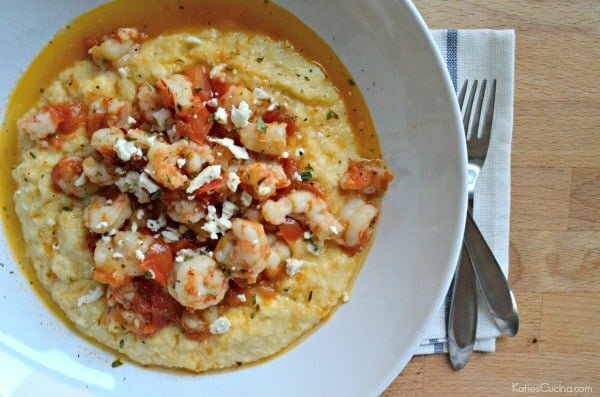 The tanginess of the feta brings these Rock Shrimp with Tomato Basil Feta Cheese Grits over the top and a perfect meal for 2! In a large pot bring the milk and water to a boil. Turn the heat off and add in the hot sauce, greek seasoning and salt. Mix well then stir in the grits. Mix well and place a lid on the pot. Place the grits on low heat and cook for 10-15 minutes, stirring occasionally. Once the grits have absorbed all the liquid and they are soft, stir in the heavy cream. Then stir in the cheddar cheese and the feta. Mix well, place lid on grits and set to the side. While grits are cooking, In a 12-inch sauté pan, combine grapeseed oil and butter. Melt on high then add in the onions and garlic. Reduce heat to medium, sauté for 2 minutes then add the diced tomatoes, greek seasoning, hot sauce, and oregano. Cook for 2-3 minutes until beginning to soften. Pour the white wine into the skillet. 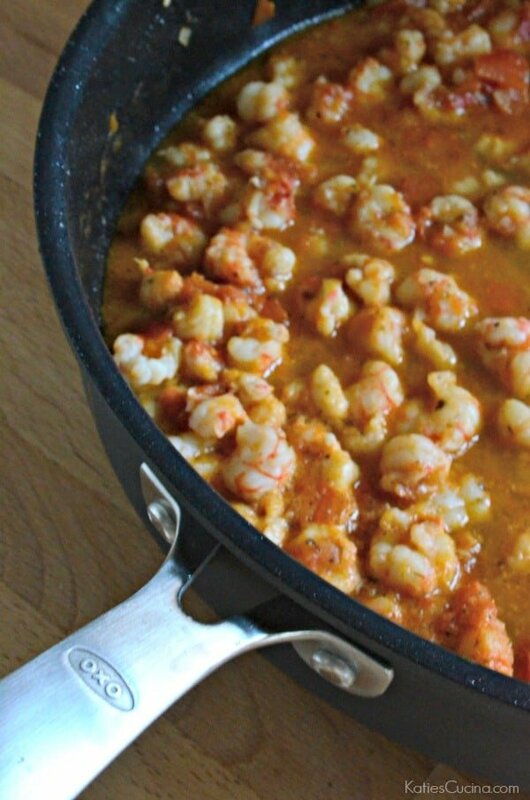 Give one good stir and then place the rock shrimp into the skillet. Stir again, place lid on the skillet and cook for 5 minutes. Once shrimp are cooked assemble dinner. Divide the grits evenly among the two plates then divide the shrimp among the two bowls. Top with additional crumbled feta and parsley. *if the grits start to get too thick (or sit on the stove top for a while) feel free to add in a little more milk to make them a softer-thinner consistency. Just heat on medium-low and mix in milk until you get your desired consistency. Disclaimer: I was provided a skillet to review from OXO. I was not compensated nor required to blog about the skillet. As always all opinions are my own. This looks amazing Katie! I must try it. I have two bags of grits siting in the cupboard (yellow and white). I was going to prepare them following Sean Brock’s recipe in Heritage. Any preference for white or yellow? Lived in Fla for 4 years now and never made grits! Your recipe might actually might encourage me to try them! 🙂 Have a great weekend! I use the white grits although I don’t think it matters. The key to good grits is seasoning them really well and I think having a good sauce to go on top! Good luck and enjoy!